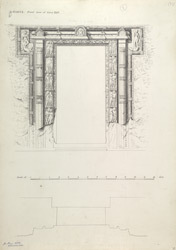 Illustration of the front door of Cave XXIV at Ajanta from James Burgess' 'Original Drawings from the Buddhist Rock Temples at Ajanta.' The Buddhist cave temples of Ajanta were excavated into a horse-shoe shaped cliff overlooking the Waghora River in the 2nd ? 1st century BC and later in the 5th century AD. Cave XXIV was left unfinished when the excavations were interrupted in the late 5th century. The pillars from the verandah are mostly fallen but still show their elaborate ornamentation. The shafts were carved with medallions with aquatic monsters or makaras with foliated tails, bands of ornate foliation and scrollwork and half lotus motifs. The capitals have the shape of compressed ribbed amalaka fruits with small figures of ghanas supporting the bracket. These are elaborately carved with small amorous couples and flying figures.